Restoring a malfunctioning electric motor to working condition while understanding the root cause of the failure are essential components of the repair process carried out each day at Acme Armature Works Inc. in Sheboygan, Wis.
Acme Armature Works Inc. Owner Chad Bahrs places a high standard on not only repairing each motor, but also diving down into the deep complexities of each system to gain a clear picture of the reason for each failure. 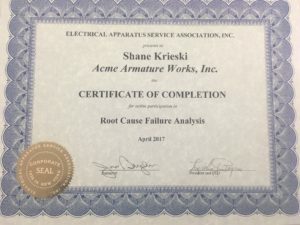 That is why Bahrs and Acme Armature Works Inc. Repair Technician Shane Krieski attended an Electrical Apparatus Service Association (EASA) Root Cause Failure Analysis Certification course in Minneapolis, Minn. this past April. The full-day course placed a heavy emphasis on troubleshooting a wide range of electric motor failure scenarios to help reduce the length of the repair process and aid in communicating with customers to avoid repeated failures in the future. 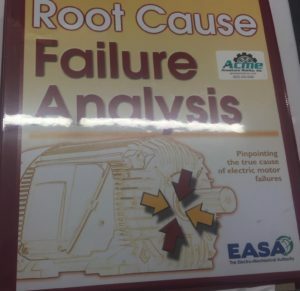 The course covered root cause methodology, while examining the details of bearing, shaft, stator, rotor, mechanical, DC motor and accessory failures. 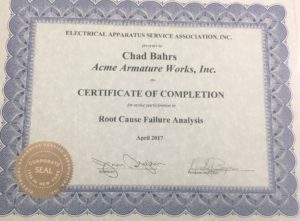 No matter what type of failure, Bahrs says reporting the cause of the malfunction to customers is standard practice at Acme Armature Works Inc.
Bahrs says his customers are typically thankful to learn of the root cause of motor failures. For more information or to request service with Acme Armature Works Inc,, email info@acmearmature.com, call the 24-hour service line at 920-452-3389 or visit www.acmearmature.com.